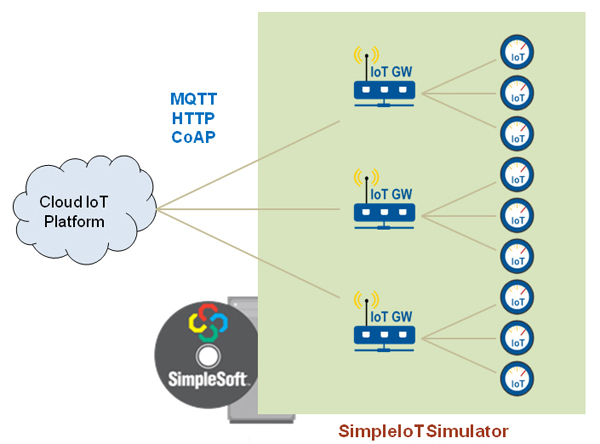 SimpleSoft's IoT Simulator for CoAP, MQTT, MQTT-SN, HTTP/REST sensors and gateways. "We found the SimpleIoTSimulator useful in quickly creating simulated customer scenarios to give realistic sales demos. The simulation has also helped our customers visualize the power of Cognito Networks solutions prior to deployment." SimpleIoTSimulator™ is an easy to use, IoT Sensor/device simulator that quickly creates test environments made up of thousands of sensors and gateways, all on just one computer. MQTT is a publish/subscribe based protocol. Both MQTT ver 3.1 and ver 3.1.1 clients are supported and simulated sensors can be setup to periodically publish messages to a specified broker. A built-in learner utility is also included that subscribes to a broker and learns messages for subseqent replay. MQTT-SN is a variation of MQTT for Sensor Networks that has a more compact packet encoding. Like MQTT, simualted sensors can be setup to periodically publish MQTT-SN client messages to a specified broker and a built-in learner utility is included to learn messages for subsequent replay. MQTT-Broker receives MQTT subscribe requests from applications within the cloud/platform and sends publish messages to them. The simulator supports this functionality to simulate thousands of gateways. Optional bridging to another MQTT-broker in the cloud is also available. CoAP is an IETF proposed standard for retrieving and managing information for sensors and devices in a constrained environment. Using patented technology, the simulator can "learn" from existing CoAP sensors/devices to duplicate customer environments, or use the learnt data as a template to create thousands of sensors and gateways. HTTP/s client sends periodic XML/REST requests to cloud/platform servers. The simulator includes learner applications to learn http requests and periodically send them to specified servers for simulating thousands of gateways. HTTP/s server responds to incoming HTTP requests with responses. The simulator can be setup using learnt data for simulating gateways that support this functionality. Modbus over TCP encapsulates Modbus, the industry's serial de facto standard since 1979, within TCP packets to enable communcation with automation devices. The simulator can "learn" from existing Modbus over TCP servers to duplicate customer environments, or use the learnt data as a template to create thousands of Modbus managed devices. BACnet/IP server responds to incoming BACnet unicast and broadcast requests with responses. The simulator can be setup using learnt data for supported objects and their properties. A few services (Who-is, I-am, ReadProperties, ReadPropertiesMultiple) are currently supported. A learner utility is also included. LoRa Gateway receives LoRa frames (PHYPayload) from LoRa devices over UDP and encapsulates them into LoRa GWMP (Gateway Message Protcol) packets and sends them to a designated LoRa Network Server. Upon receiving downstream messages from Network Server, it extracts the frame payload and forwards it to the appropriate device over UDP. LoRa Device currently supports LoRaWAN 1.0.3 specification for Class A and C devices and transmits created LoRa frame (PHY Payload) to one or more associated LoRa Gateways over UDP. It supports activation by both Over-the-air-activation(OTAA) and Activation-by-personalization(ABP) methods for setting up security keys. The signal strength, signal-to-noise and channels can be specified when talking with specific gateways. The data payload can be modified by scripts to exhibit different sensor behavior. SimpleIoTSimulator enables IoT platform and gateway vendors to improve product quality and significantly shorten their time-to-market without incurring large capital expense for creating test infrastructure. Both IPv4 and IPv6 sensors are supported and the simulator includes built-in support for lossy behavior in constrained environments. It can also create scripted error scenarios on demand. Example scripts to work with popular platforms like Azure IoT, Amazon AWS, IBM Bluemix and others are available to facilitate quick setup. Use the built in MQTT, CoAP, Modbus, BACnet and HTTP learner utilities to record packet exchanges from real servers/sensors/devices. Use this learnt data as a template to create test environment with thousands of IoT sensors and gateways. Run scripts to create error scenarios, and dynamically change properties. Support for changing data is built-in without requiring any user programming as is lossy behaviour and delay. If support is also needed for other management protocols like SNMP, Telnet, SSH, an IoT management module is available within the popular SimpleAgentPro and SimpleAgentEnterprise. Sales groups can create realistic demos that highlight the management application features to shorten sales cycles. Development and QA groups can do scalability and functional testing without large test infrastructure. Professional services can create targeted services using duplicated customer environments. Tech Support departments can more easily reproduce customer problems in their test labs. Sensor data changes can be modelled to create different physical environments. Simulate LoRaWAN networks to demonstrate and test User Application Software and LoRa Network Servers (application notes). Can be used by both LoRa Network Service Providers and their customers. Please email sales@simplesoft.com for trial or purchase.